A busy lifestyle can certainly make time pass quickly. Before you realize it, your smile will be due for another dental exam and cleaning. We recommend scheduling your next appointment prior to leaving our dental office in Cooper City to prevent missing a cleaning. Skipping a professional cleaning and exam may become costly in various ways. Regular dental check-ups may prevent oral diseases (such as decay and periodontal disease) from developing. Routine exams allow our dental team to find premature signs of mineralized plaque (tartar), which can cause damage to your teeth and gums. Other dental problems such as loose filling, dry mouth, and impacted wisdom teeth may also be detected and treated to prevent worsening dental problems. The earlier dental problems are detected, the less costly and invasive the treatment will be. 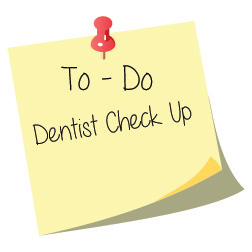 During your check-up, our doctor will screen your smile for early signs of gum disease, decay, and oral cancer. In early stages of gum disease, a non-surgical deep cleaning is able to treat mild to moderate conditions. However, intense cases of gum disease can require gum surgery. Cavities also benefit from early detection. Cavities can infect and damage the pulp of the tooth. Deep pulp infections require root canal therapy. Once a cavity is left untreated for a longer amount of time, the affected tooth can become severely damaged may require an extraction. Regular check ups at our Cooper City, FL dental office prevent costly treatment such as extractions and root canals from being needed. Please visit our office more than twice a year to maintain a strong and bright smile. Contact the dentist in Cooper City to schedule your next routine dental exam. We look forward to your visit! This entry was posted in Uncategorized and tagged cooper city dentist, cooper city florida dentist, dentist in cooper city, dentist in cooper city fl. Bookmark the permalink. ← Cooper City Dentist: Does Your Oral Health Put Your Heart at Risk? They have outstanding customer service! There was an issue due to miss communication, and they called and explained everything. Very friendly and understanding staff. 10/10 would recommend to everyone.